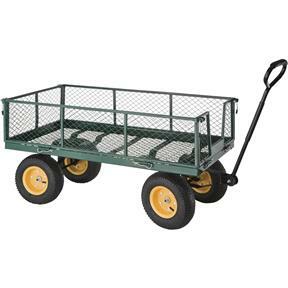 A rugged, heavy-duty garden wagon with sides which fold down when the locking pins are removed. Avoids high lifting when needing to load something heavy or bulky. Pneumatic tires help absorb the bumps. Includes hitch attachment for a garden tractor. Steering handle is padded for comfort. Platform size is 48" x 24". Maximum capacity 700 lbs. Approximate shipping weight: 100 lbs. We have been using this cart a lot to haul firewood from the shed to the cabin.....and it is very useful. I have used a similar cart before that had a lower center of balance.....and I must admit that I liked that one better. This cart sits up higher and can topple over if the ground is uneven. Then, you have to re-load the cart.